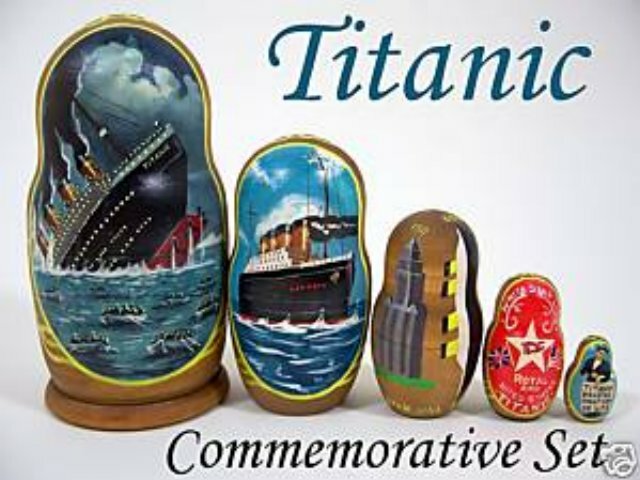 This nesting doll set was designed several years ago, specifically for the Titanic Exhibit at the Museum of Science and Industry in Chicago. The Russian Doll Company commissioned Russian artisans to create this unique and historical set. The first piece depicts the actual event of the sinking of the Titanic. You see the ship at night, sinking in the water with the people in the lifeboats. The second piece shows the ship in all of its glory, as it was before the terrible tragedy. The third piece shows several size comparisons to actual buildings of that time. If the Titanic was stood up on its end, it would be taller than the tallest buildings in 1912. The Titanic was 882 feet/268 meters long.